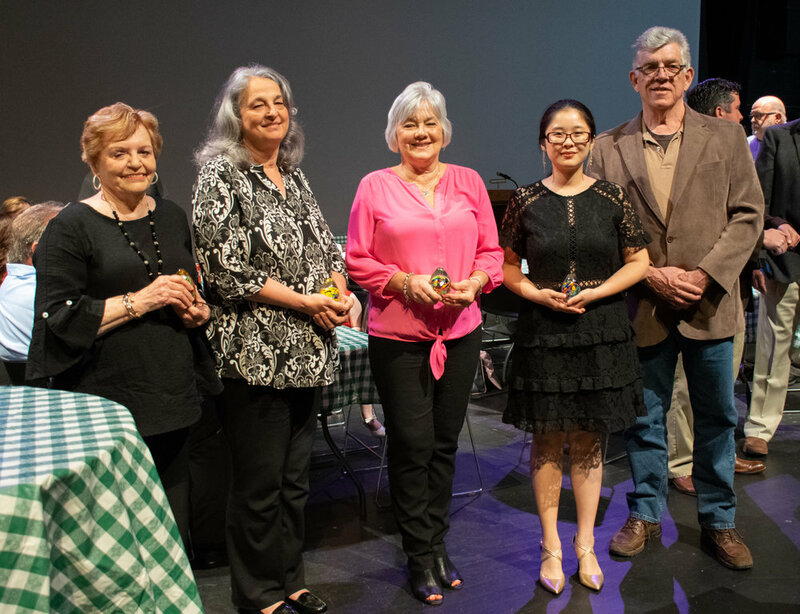 The Arts & Science Center honored dedicated volunteers with an awards presentation and reception at the 2019 Volunteer Night on Thursday, April 11. Jonathan Hoover was honored with the 2019 Catherine M. Bellamy Award for the Performing Arts during the Arts & Science Center’s Volunteer Night awards and reception on Thursday, April 11. Yunru (Rachel) Shen, for her work on Second Saturday Family FunDay and TinkerFest programming. A new award was introduced this year, the tongue-in-cheek “Volun-Tolds” — a special recognition of Scottie Abernathy, Jeff Collins, Rich DeBill, Kenny Fisher, Michael Healy, Mike Kline, and Mike Lake “for their continued patience and willingness to be volunteered by their significant others for countless ASC events, productions, and programming.” The honorees received personalized beer “huggies” from NovelTs. A compilation of videos submitted by past and present volunteers was shown following the awards presentation. Volunteers — which also included past ASC production cast and crew — were asked to submit short videos of themselves sharing their volunteer contributions to ASC. Rich DeBill (from left), Michael Healy, Mike Lake, Jeff Collins, Mike Kline, Kenny Fisher and Scottie Abernathy (not pictured) were honored “for their continued patience and willingness to be volunteered by their significant others for countless ASC events, productions, and programming” with awards dubbed “The Volun-Tolds.” The honorees received personalized beer “huggies” from NovelTs. Pine Bluff Sand & Gravel Co. and MK Distributors sponsored the event. Art Krewe, a volunteer group of community art lovers who have hosted ASC’s receptions for more than 25 years, hosted the reception. Those interested in volunteering at ASC can find out more on ASC’s volunteer webpage or by calling 870-536-3375. Application forms are available online or can be picked up at ASC’s front desk. Like many nonprofit organizations, the Arts & Science Center could not serve its community and fulfill its mission without dedicated volunteers. Five volunteers will receive a Good Egg award — crafted by glassmaker James Hayes — during ASC’s Volunteer Night on Thursday, April 11. ASC’s Volunteer Night, set for 5:30 p.m. Thursday, April 11, is a celebration of the those who have given their time at the Arts & Science Center over the past year. The event, sponsored by Pine Bluff Sand & Gravel Co., is free and open to the public. A reception will follow and is hosted by Art Krewe, a volunteer group of community art lovers who have hosted ASC’s receptions for more than 25 years. The 2019 recipient of the Catherine M. Bellamy Award for the Performing Arts is Jonathan Hoover. Hoover regularly works with ASC’s theatrical programs and events such as Potpourri. He is a logistics analyst at the Pine Bluff Arsenal. DeBill, who is the past Chair of ASC’s Board of Trustees, regularly leads classes at ASC such as Canvas & Cork and Wood & Wine. 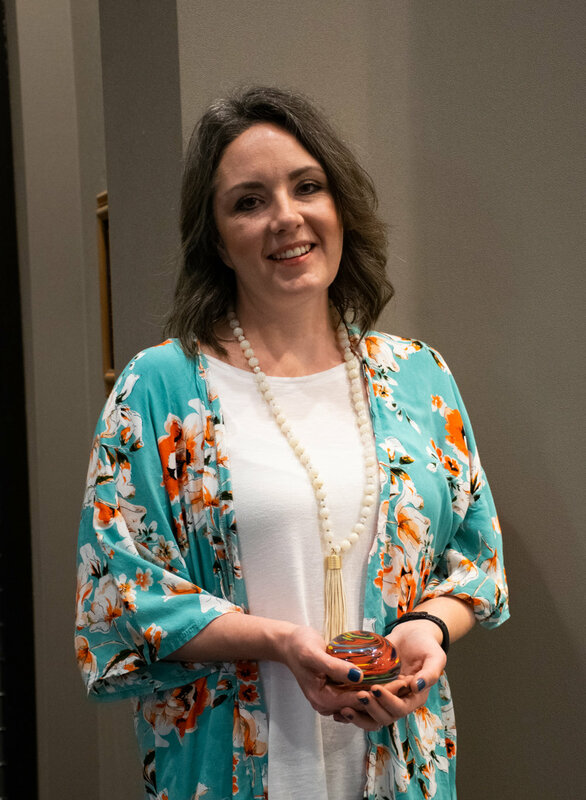 She served as co-Chair for ASC’s biennial fundraising gala, Potpourri, in 2018. She is the EAST facilitator at White Hall Middle School. ASC will also give out Good Egg Awards. “Those are people who also have really gone above and beyond for their volunteer work,” Collins said. Good Egg Award recipients include Pam Holcomb and Donna Oates for their work on costumes for several ASC productions; Charlotte England for her work at receptions and special events; Bill Moss for his behind-the-scenes volunteerism and unwavering advocacy for ASC; and UAPB Merchandising, Textiles & Design faculty member Yunru (Rachel) Shen, for her volunteer work on Family FunDay and TinkerFest programming. The Good Egg awards are crafted by glassmaker James Hayes. The final award category is a bit tongue-in-cheek. “This year, we’re adding a special recognition of a few men for their continued patience and willingness to be volunteered by their significant others for ASC events, productions, and programming,” Collins said. Those awards will go to Mike Kline, Michael Healey, Rich DeBill, Jeff Collins, Kenny Fisher, Mike Lake, and Scottie Abernathy. During Volunteer Night, a video will be shown featuring interviews with volunteers who have donated their time over the past 50 years with the Arts & Science Center. Volunteers are asked to submit a video of 5 minutes or less of themselves sharing their volunteer contributions to ASC. The videos may be sent via email to lcollins@asc701.org by Saturday, April 6. “I can’t stress enough how important volunteers are, especially with the theatre and a lot of the things that go on here at the center. Volunteers are important. We need them,” Collins said. The Arts & Science Center invites the community to learn more about the area’s cultural heritage during the 2019 Crossroad Festival, ASC’s three-day, family-friendly cultural celebration. This multi-program event explores Jefferson County and Southeast Arkansas’s cultural heritage through the interpretive lens of story, music, foodways, and film. All festival events are free and open to the public with no tickets or reservations required. Families are encouraged to attend. Each year, the festival highlights different cultural groups that have made a lasting impact on the history, culture, and traditions of Southeast Arkansas. This year’s event features programming on the African American, French and Chinese communities’ regional cultural heritage. The festival kicks off Friday, March 1, at 7 p.m. with a program incorporating African American folktales and slave narratives into an interpretative performance involving musicians and actors from the community. Saturday, March 2, features two family programs featuring folklore and food, with hands-on activities. The event caps off Sunday afternoon, March 3, with a screening of the 2006 animated film The Adventures of Brer Rabbit, with director and Pine Bluff native Byron Vaughns. The 2019 Crossroad Festival is supported in part by a grant from the Arkansas Humanities Council and the National Endowment for the Humanities, and sponsorships by the Pine Bluff Advertising & Promotion Commission and Simmons Bank. This is the second year for the Crossroad Festival. Last year’s festival focused on the region’s Quapaw Indian, French, and African American cultural heritage. The Crossroad Festival was inspired by ASC’s Heritage Detectives project. A historian and artist were placed in Pine Bluff, Dumas, McGehee, and Lake Village classrooms to work with students on uncovering and depicting the diverse cultural influences of Southeast Arkansas through pictorial histories. The festival idea percolated after ASC staff attended cultural programs at other institutes. ASC will host a screening of the animated film The Adventures of Brer Rabbit on Sunday, March 3, at 1 p.m. during the Crossroad Festival. Shortly thereafter, ASC staff attended a screening of the documentary film First Cousins: Cajun and Creole Music in South Louisiana documentary, and met with the film’s producer and scholar Dr. Elista Istre about influences of Cajun and Creole culture in Delta regional music. “All agreed that Pine Bluff, a city originally settled by Joseph Bonne, who was half French and half Quapaw Indian, would be ideal central location to host a cultural event that explores the county's French and Quapaw roots through primary sources,” Miller said. In June 2017, ASC hosted a free screening of the AETN documentary, Dream Land: Little Rock’s West 9th Street. “We received an overwhelming response from the audience to host more similar events that focus on the area's African American heritage,” Miller said. Subsequently, ASC reached out to Jimmy Cunningham Jr., executive director of the Delta Rhythm & Blues Bayous Alliance, about organizing an event exploring Jefferson County’s African American history through music. This year’s festival kicks off with a night of lore, music and interpretation with the program Tricksters, Tall Tales, and Blues Notes. The event will combine living history, folklore, and musical performance in exploring African American experiences in Southeast Arkansas. Jimmy Cunningham Jr., with whom ASC collaborated during last year’s festival, writes and directs this program featuring regional actors and musicians. The program is presented in four parts, and will explore four themes: folk heroes, prison folk music, animal folktales, and urban folklore. The festival’s second day will comprise two family-friendly programs, with lunch available for purchase. In the morning session, Heritage Studies and Living History Interpretation scholar Dr. Elista Istre will lead Folktales Family Fun — a family storytelling, hands-on program. She will share traditional French Creole stories of the characters of Bouki (a fox) and Lapin (a rabbit), which are similar to the “Brer Rabbit” tales. She will also explore the links between West Africa, the Caribbean, and the American South. The program will include a craft workshop in which the children can make a mask of Bouki or Lapin to take home with them. Ilstre is the founder of Belle Heritage, offering consulting, programming, and tours that inspire individuals and organizations to celebrate the beauty of heritage. Last year, University of Louisiana at Lafayette Press published her book Creoles of South Louisiana: Three Centuries Strong, which began as a dissertation during her time in Arkansas State University’s Heritage Studies program. She will have her books available for purchase at the festival. She was also involved with the 2018 Crossroad Festival. She and her sister, Dr. Moriah Istre, screened their documentary film, First Cousins: Cajun and Creole Music in South Louisiana, and sat on a panel that discussed the French connections within Louisiana and Arkansas. She lives in Lafayette, La. For the afternoon program, Istre will join Food Studies and Material Culture scholar Kevin Kim to expand the festival theme of cultural diffusion and adaption with Foodways & Tales. The program will provide a historical context for the foodways of South Louisiana’s Creole people, and Southeast Arkansas’s Cantonese communities, and address how both cultures have negotiated the fine lines between assimilation and isolation within the larger mainstream American culture. Both scholars will share family stories and recipes. In a cooking demonstration, children from the Jefferson County 4-H Club will cook greens the Creole way to compare and contrast with how the Cantonese prepare greens as demonstrated by Kim. Kim is a doctoral student in the Department of American Studies at the University of Maryland, College Park, where he also teaches courses on material culture and popular culture. His research interests focus on the cultural politics of food in American life, with a special emphasis on Asian American foodways. His work has been featured on National Public Radio (NPR). He has held curatorial internships at the Smithsonian’s National Museum of American History and has worked with the Southern Foodways Alliance. He was born in South Korea and has lived in Los Angeles and Little Rock. Pop’s Place food truck will be at ASC from 11 a.m. to 1 p.m. so visitors can enjoy lunch between the programs­. Continuing the exploration of African American folktales, ASC will close the 2019 festival with a screening of the 2006 animated Universal Pictures film The Adventures of Brer Rabbit. A question-and-answer session will follow with the film’s director, Byron Vaughns. A Pine Bluff native and a graduate of the University of Arkansas at Pine Bluff, Vaughns has worked on many classic animated television shows including Alvin & the Chipmunks, The Smurfs, Animaniacs, and He-Man and the Masters of the Universe. He won an Emmy in 1993 for directing Tiny Toon Adventures, which was selected for best animated daytime series. Vaughns lives in White Hall after residing in the Los Angeles area for more than three decades.